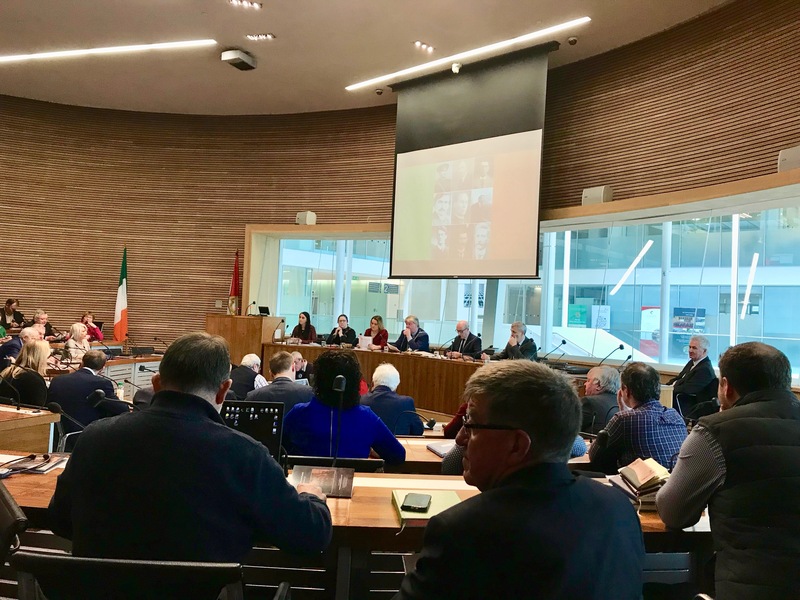 Special meeting of Cork County Council in Cork County Hall, to commemorate the first meeting of Dáil Éireann. 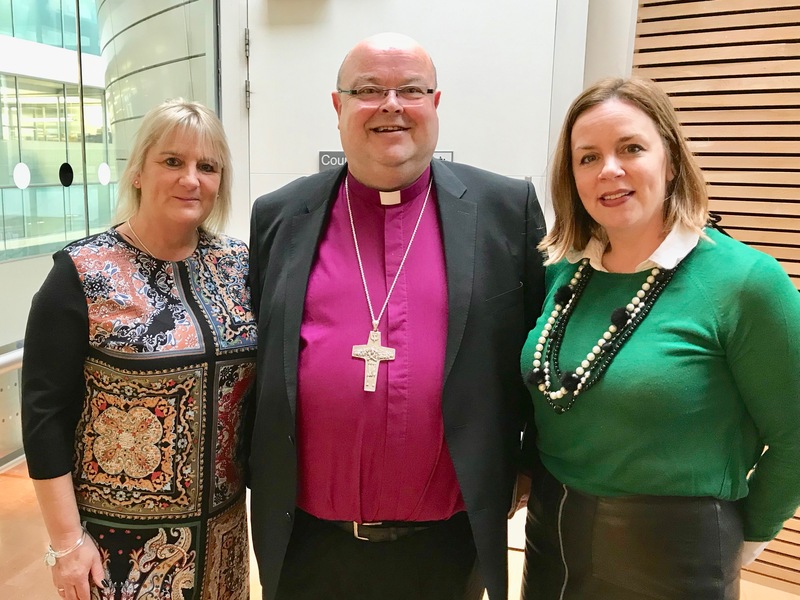 As part of the Cork, Cloyne and Ross Diocesan Commemorations and Reconciliation Project (supported by the Church of Ireland Priorities Fund) Bishop Colton has been working in partnership with other bodies and agencies in Cork City and County who are also engaging with the Decade of Centenaries. In the case of Cork County Council he has been working with the County Heritage Office, Conor Nelligan, and Nicola Radley, Senior Executive Officer at the Corporate Services Directorate at Cork County Council. Bishop Colton with (left) Cllr Frank O’Flynn, Chairman of the Cork County Commemorations Committee, and Cllr Kevin Murphy. Yesterday’s meeting, like that of the First Dáil, was conducted principally in Irish, but included also an excerpt in French from the ‘Message to the Free Nations of the World.’ The meeting commemorated the nine Corkmen who were elected to the First Dáil: Liam De Róiste; James J Walsh, David Kent, Terence MacSwiney, Patrick O’Keeffe, Thomas Hunter, Michael Collins, Diarmuid Lynch and Seán Hayes. Principal addresses to the meeting, in Irish, were made by the Mayor of Cork County, Cllr Patrick Gerard Murphy, and the CEO of Cork County, Mr Tim Lucey. In itself, the meeting made history as it was the first recorded bilingual meeting of the County Council. At the special meeting were (l-r) Cllr Mary Linehan Foley, Bishop Paul Colton, and Cllr Susan McCarthy. A keynote address was given by Dr Neil Buttimer from the Department of Modern Irish at University College, Cork. 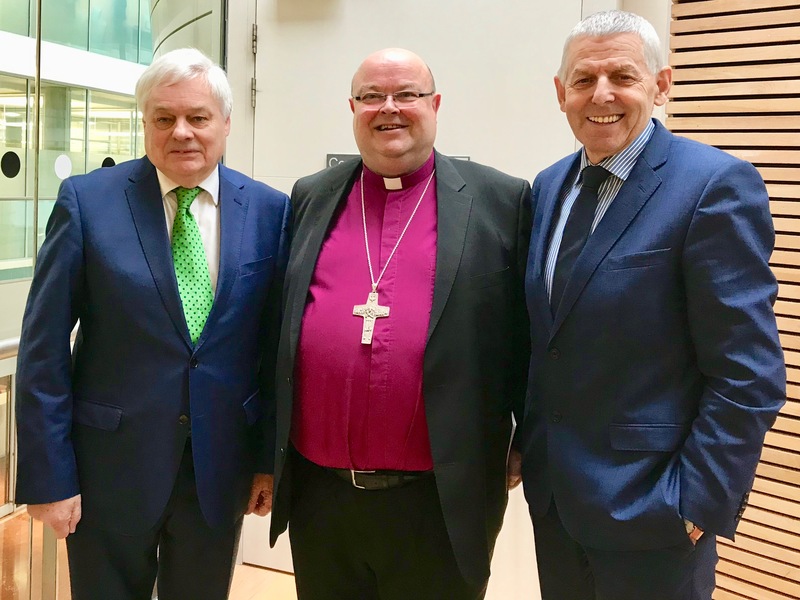 Bishop Colton was warmly welcomed to the special sitting of the County Council by the Mayor and Councillors, as well as the chairperson and vice-chairperson of the Cork County Commemorations Committee. 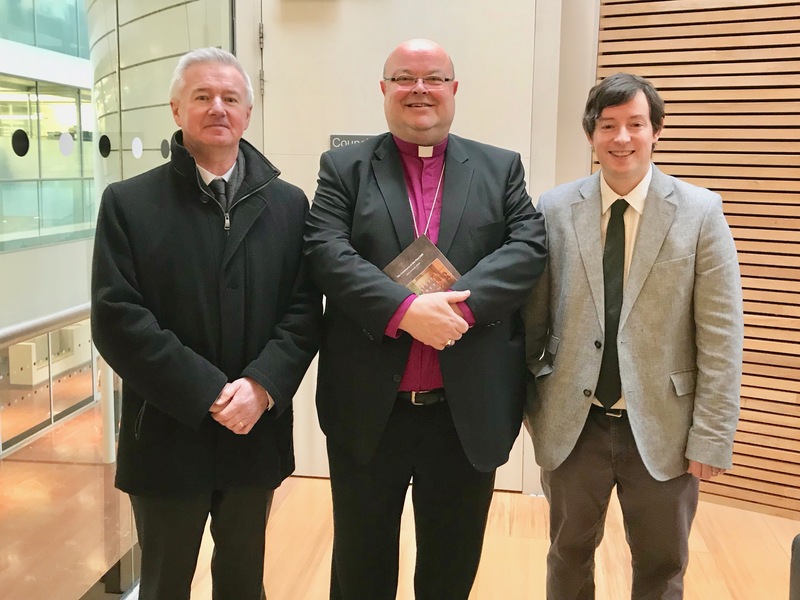 Dr Neil Buttimer (left) Department of Modern Irish at University College Cork, Bishop Colton, and Conor Nelligan, Cork County Heritage Officer. This entry was posted in Centenaries in Ireland, Centenary, Cork, Cork Centenaries Commemoration and Reconciliation Project, Decade of Centenaries. Bookmark the permalink.